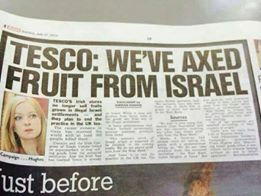 British grocery giants Tesco have been under attack by BDS for a long time now, and have reportedly been intermittently removing Israeli produce from their shelves. They still seem to be stocking Israeli products at time in some branches, and their official position is that they continue to do so, but might be boycotting produce from Judea and Samaria/West Bank disputed areas. Please contact them and encourage continued stocking of ALL Israeli products, and support whatever Israeli products they supply.